Dyna-Ski Boats: How long does it take to build a boat? This is a question I often get from people shopping for a Dyna-Ski Boat. The answer is simple sort of. It takes a week or two to actually build the boat. However there are many factors that influence how long it actually takes to get a finished water ready Dyna-Ski boat. Almost all of them are out of the hands of the boat building crew and me. So if we have everything on hand we can knock out a boat in a week or two. All Dyna-Ski Boats are custom built to order. The only exception being the demo boats I have. We build them when things are slow and equip them like many Dyna-Ski boats are sold. Once in a while we will try something new but not real often. Now for some of the factors that effect the boat building process. First of all there is the customer. The longer it takes the buyer to decide what they want often delays the start of the their boat. If they are not sure of the color very little if anything can be done. We don't believe in building boats and letting them sit outside waiting for a buyer like many companies do. Many dealers and not just boat dealers do this with everything they sell. Thousands of vehicles, boats, ATV's snowmobiles, lawn mowers, etc. sit outside for long periods of time waiting for a buyer's garage. I am old enough to remember when mom and dad went to the new car dealers to order a car and then they waited hoping that the new car was delivered as ordered. No one bought a new car off the dealer lot! 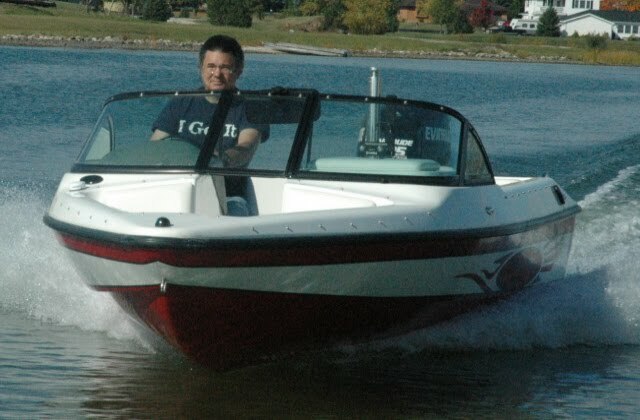 A Dyna-Ski boat can be delayed by the down payment being sent slowly. We build all our boats based on when the money is received. When we get the down payment your place in line is established. The only ways your place in line slips is if you give us a certain day you want the boat or if a supplier fails to come thru with something needed to build your boat. The suppliers are the biggest issue by a wide margin. Many fiberglass materials have a shelf life. If the product gets old it should be thrown out. Using out of date materials is not a good idea. I'd be willing to bet that some manufacturers use outdated materials. We do not. Not to long ago fiberglass products that were ordered on Monday, got delivered on Thursday or Friday and the bill would come around the end of the month with 30 days to pay. Not any more! Now we have to order the product we need, pay for it and then wait. Sometimes as long as three months. It does get real ugly. There are plant shut downs, vacations, holidays and all sorts of things that come into play. I should also mention that fiberglass product prices go up and down (usually just up) all the time kind of like gasoline. This makes it hard to know exactly how much the boat hull and deck are going to cost only 30 days from when a customer asks for a price. Many other prices also continue to slowly go up. Every time we reorder the prices are higher and waits are longer. It has taken almost a year to get windshields since they were ordered. YIKES! There are as many as 500 parts in a water ready boat. We have a limited amount of space and money for inventory. Space is the biggest problem. It is an uphill battle to keep as many things as possible on hand to build boats. I feel we are pretty good at anticipating what we need and ordering with plenty of time to have everything on hand when your boat is scheduled to be built. Sadly it does not always work out that way. The suppliers of the bigger items needed like the trailers and steering just to name two obvious items can be eight weeks out as we come into the time when customers typically want to start taking delivery of their new Dyna-Ski. The normal lead time is three weeks for them both. We keep some things on hand but the more big items in stock the more it costs to build a boat. I don't like to keep new trailers or boats outside period. The motor manufacturers have been pretty good but from time to time even shortages have occurred from them. We get as many of the motor specific rigging parts and pieces from the motor manufacturers as we can. I like Evinrude, Mercury and Yamaha specific rigging used with each specific brand of engine. So if you have a problem with any part of the power train chain in years to come your local dealer can service the problem easily. If we mixed and matched rigging parts and pieces the local dealer could blame the problem on the generic stuff that some manufacturers use to save a little money. For instance if an Evinrude tachometer fails the local Evinrude dealer can easily replace it. Not so if we used a generic tachometer. If in 10 years you want a newer and more technically advanced outboard engine you can just trade the old engine in at the local dealer and have him install the new engine. This may not be possible with generic rigging of a boat and motor. It is really that easy as long as you stay with the same brand normally. Try this with an inboard water ski boat. There are many little things that are used to build a water ready Dyna-Ski Boat that you don't give much thought to until one cannot finish a boat because of the back ordered item so the water ready boat can be delivered or picked up by a new customer. A customer that is anxious to get their new Dyna-Ski boat on the water. A new fishing boat is in the shop waiting on some grab handles that have been on back order since before Christmas! The boat shop builds Recon fishing boats and a line of skiffs as well as Dyna-Ski Boats. So if you wanted a Dyna-Ski "Ski & Fish" we could likely build you one during the slow part of the year. The boat shop also does repairs, rebuilding and replacement interiors for all types of boats. This work helps to pay the bills and keep the costs of new boats down as well. We also learn from fixing other builders boats and have learned from fixing old Hydrodyne boats. Boat building is the #1 thing we do so everything else fills in the dead time, keeps the crew working and getting paid. The internet means lots of people can now find, check out and shop Dyna-Ski Boats. Many more people are checking out Dyna-Ski Boats. More people are buying Dyna-Ski boats. With more sales comes longer waits. My best advice is to order any boat well before you want to use it. The interest rates that banks are paying and charging are pretty low so the cost of money is low. Your money in a saving account of any type isn't making much. Waiting even a few days can result in a long delay getting your new custom built for you Dyna-Ski Boat. Some things can be decided after you order your Dyna-Ski Boat, some cannot. It would be awful to be watching every one else on the lake because you waited a few extra days to order or send the money. I'd hate to have to start guessing how people want Dyna-Ski Boats built and build boats to sit outside. A boat is a luxury and they do cost a lot of money. I think that you would hate to have to settle for an in stock packaged boat of any kind to save time. Taking your time to decide exactly what you want is a good idea. Keep in mind that paying more money won't speed up the process. We have had people ask, even ski teams! We don't normally sell our demo Dyna-Ski boats until fall so when people want to try a Dyna-Ski Boat in the summer they can. Selling a demo Dyna-Ski in the spring or summer can be dicey as we are often building boats for customer orders so we cannot build a replacement demo. Some people like to try a boat before they buy a boat. If we sell a demo and get some late orders I don't have a Dyna-Ski Boat that people can try or time to build a replacement. We do our best and try as hard as we can but some things and many suppliers cannot be rushed. Now that you have read this information maybe you now know how long it takes to build a Dyna-Ski Boat? What I really hope is that you understand that the answer changes daily it seems.